‘SEOers’ like to use the term “anchor text” to Cheapflights.co.uk integrates the keyword ‘cheap flights’ into three links. At the bottom you see the flags with links to each countries cheapflights domain. Notice the four English-speaking countries; the UK, USA, Canada and Australia/New Zealand. Firstly, the UK link will simply return to Homepage – the real link for humans to find the Homepage is at the top along with the human sitemap and help bar. ...and they didn’t hit #1. eBookers.com grabbed that spot. But cheapflights.com sprang up at #2, and cheapflights.co.uk hit #1 on the sponsored results. What does this suggest? UK and US searches surf differently? The important of integrating your keyword into text links is again to do with the credibility factor. A page that is directing traffic away, but still under its own keyword is there for a reason – to provide valuable resources for the visitor to click through and discover more. Incorporating keywords into your link text is important. It helps search engines determine what you are trying to achieve with your link. Here are some examples – we’ve simply underlined what would be hyperlinks. Although the human can put the link in context, it provides little value to search engine robot. All they see is ‘blahblahblah – link “here” to domain.com/newslettersign-up’. What are you on about? Example #2 – Get Your Free Website Here! This time, the search engines can see what we’re on about. But they can also determine our link-placement motives. “Get” and “Free” give the impression that the links are only there to earn the webmaster money. Fair enough, everyone needs to earn a living. But the motives aren’t necessarily to improve user experience. It is a low credibility link. 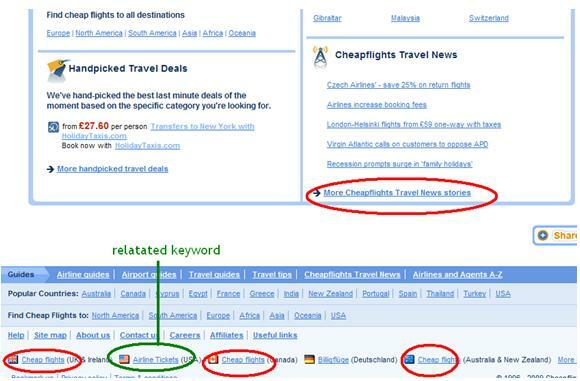 Example #3 – Why don’t you try using Wordtracker to search for keywords? This time we’ve put the link in context for both the search engines and the human. The search engine knows that we’re going on about – “search for keywords” and the human gets a rhetorical question with an action (click) to move forward. ** You can see Cheapflights.co.uk deploys text links well. Take a look at their ‘Subscribe to Our Newsletter’ link. It is positioned centrally, and beneath the pages main function – the search box’. The human visitor sees it and registers it, whilst the search engines sees the link and anchor-text.